First Prize Doc (#6) ridden by jockey Danny Lavergne wins the Gentilly Dash Stakes at the Fair Grounds Saturday over Fast Prize Jordan (yellow silks, white blinkers). NEW ORLEANS, LA�AUGUST 23, 2013�In the only open stakes on Saturday's race card at Fair Grounds Race Course in New Orleans, First Prize Doc scored his first career stakes win with a neck effort over Fast Prize Jordan. Track record holder The Lizzard King was a head behind in third. Frank Elizondo saddled the tri-fecta. Fast Prize Doc, owned by William Smith, got his fifth career win and the $30,000 winner's purse boosts his lifetime total to $70,741. The PYC PAINT YOUR WAGON colt is out of First Prize Dash, by Dash For Cash. Danny Lavergne was up to just miss the 250 yard track record with a :12.918 time, a 108 speed index. Weetona Stanley bred the 4-year-old in Oklahoma. Making his first start since May, Fast Prize Jordan recovered from an earlier bump to get out-nodded at the wire. Also a 4-year-old son of PYC PAINT YOUR WAGON, Fast Prize Jordan pushed his career total over $201,000 with a $10,000 runner-up paycheck. G.R. 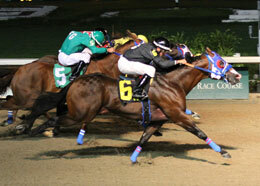 Carter, Jr. was aboard the Fast Prize Jordan Partners owned bay from the Mr Jess Perry mare Fast Prize Doll. Coming off a stakes winning effort in his last start, The Lizzard King earned $5,500 for owner/breeder Brett Mennen. John Hamilton rode the gelding. The seven-time graded stakes winner has earned $162,724. Completing the field were Game Patriots Delux, Dee Deeoro, Madresita, Zuperstar, Spartocus, Louisianaschoolboy and Sparrow Contender.